This is the fourth post in our new series “I am Agriculture”, that showcases the many careers available to young people in agriculture. Today’s post comes from Victor Taleon, who works on biofortified crops at the research centre HarvestPlus. When I was in primary school in Guatemala, I wanted to be a mechanical engineer working for Ferrari. During those years, I enjoyed classes on general natural sciences. Living in a small town in Guatemala, I was always aware of the agriculture in my surroundings. In middle school, I chose to study agriculture among other practical technical classes, mostly because it was outdoors and not because I was passionate about it. The panel was chaired by Julie Borlaug, granddaughter of the late Dr. Norman Borlaug, who said in her opening remarks, “If there was any panel that my grandfather would be most interested to attend, this would be it”. Dr Borlaug was the main catalyst in launching the green revolution in the mid-20th century. Coming from Africa, South Asia, Latin America and Europe, the five farmer panelists all discussed the ways in which more erratic and extreme weather as a result of climate change is affecting them and the need for new approaches to farming. Santiago del Solar, an Argentinian farmer, illustrated this by discussing recent rainfall on his farm over the past decade. “There’s no such thing as average rainfall,” he said, referring to the wide variation he is seeing from year to year. “In 2009, we received only 672 millimetres of rain – a big drought,” he said, “but in 2012, we received 1451 millimetres, a big flood.” In response to this and other challenges, he mitigates this and other impacts by using no till agriculture, crop rotation, GM seeds, crop protection products and precision agriculture. No till practices alone, helped him save 33% in fossil fuel use and reduce soil erosion by 70%. Meanwhile, the expectations being put on farmers by governments are increasing, said Gabriela Cruz, a fourth generation Portuguese farmer. “What does Europe expect of me?” Cruz asked herself in her presentation. “To be a superwoman” she said, “by producing safe food and reducing water and energy consumption while remaining profitable.” With Europe expected to experience even more drought and heatwaves in the future, Cruz has responded by changing her irrigation system (from flooding to centre pivot), practicing Integrated Pest Management (IPM), rotating crops and maintaining biodiverse pastures. However, to reduce her water consumption further, Cruz called on Europe to improve access to better genetics through GM crops, which will enable her to reduce inputs further and better adapt to a drier climate. Each farmer had his own story to tell and a unique set of responses which worked for their farm. But across the panel, each farmer called for the ability to choose for himself the range of solutions which worked for them and their farms. “Our farmers created history [during the Green Revolution] by transforming India into a self-sustaining agricultural nation, but we still face challenges”, said Indian farmer V.K. Ravichandran. He mentioned shrinking arable land area, depleting water resources, erratic rainfall and lack of young people becoming farmers, among others. “We should look into the possibility of cultivating other types of crops, different than conventional ones, that would fit into the new environment,” he said. Dyborn Chibonga, who heads the National Association of Smallholder Farmers in Malawi (NASFAM), reiterated this view. “Our farmers take farming as a business,” Chibonga said, “but they are still not producing as much as they should from any given area of land” because they are dependent on rainfed agriculture, shorter duration of growing season, more droughts and floods, resurgence of pests, weeds and diseases and lack of access to processing and markets. He also argued for further innovation to be identified and rigorously tested – “new technologies such as genetic modification, cloned livestock or nanotechnology”– while also ensuring “open and transparent decision-making” and “respect[ing] the views of people who take a contrary view”. During the question period, the Tanzanian Deputy Minister of Agriculture and Food Security observed that the issue of whether African countries allow GM crops is no longer about science but about political will. And he said that European activism was influencing how African policies were being written because of the fear of losing Europe as an export market (only four African countries currently allow the growing of biotech crops). Cardinal Turkson of Ghana who has served as the President of the Roman Catholic Church’s Pontifical Council for Justice and Peace since 2009. The dialogue was held in conjunction with the World Food Prize Laureate Ceremony, where three leading plant biotechnologists were honoured: Dr. Marc Van Montagu, Dr. Mary Dell-Chilton and Dr. Robert Fraley. Effectively harnessing the tools and technologies needed to advance sustainable and productive agricultural practices is one of the great 21st century challenges, and it will span the scientific spectrum from research, education, extension and enterprise. As populations continue to grow, the world’s farmers have the formidable task of providing nutritious food for 9 billion people by 2050. Several fierce challenges still stand in their way as our world resources are under more strain than ever, whilst at the same time more frequent and extreme weather conditions caused by climate change are affecting farmers ability to produce enough food to meet demand. These issues are incredibly complex to solve, yet are becoming increasingly urgent. Public-private partnerships (PPPs) are one way in which expertise from different fields can be combined to reach innovative agricultural solutions. Public-Private Partnerships are formed by public organisations and private sector businesses in order to share knowledge, skills and expertise allowing them to meet a common goal. They operate on the principle that by combining their strengths, all partners can make better progress than they would alone. Public partners include research institutes, universities and NGOs, who have the ground-level knowledge and understanding of the issues in question. Private partners includemultinational corporations or producer associations, who can not only inject capital into projects, but also provide specialist skills and provide successful marketing and distribution channels. According to Syngenta, public investment in productivity-enhancing agricultural research and development has been declining in most of the world outside China. Private investments and capability, on the other hand, continue to grow. Collaborative partnerships can effectively bridge the gap between public and private sectors’ distinctive competencies in order to meet farmers’ needs. For national governments, partnerships offer a way to translate shared research outputs into useful, relevant tools for their own farmers. They can offer access to a greater variety of technology choices; they can spread and share the financial burden of research; and they can create a flexible, expert resource for capacity-building. For the private sector, public-private partnerships have potential to increase the leverage of a deep knowledge-base. They offer a mechanism to share the costs of infrastructure and diffusion, and also an opportunity to increase the effectiveness of technologies over time. Finally, they can make individual innovations better adapted to local conditions, and in so doing enhance the quality and quantity of sectoral knowledge. Such partnerships are already in progress in the developing world. In Africa, a new public-private partnership called Water Efficient Maize for Africa (WEMA) was formed in 2008 to help smallholder farmers and their families by using advanced plant breeding and biotechnology to develop more drought tolerant maize varieties. The partnership comprises of the not-for-profit organization the African Agricultural Technology Foundation who co ordinate, as well as private agricultural companies such as Monsanto and BASF who provide access to access proprietary germplasm, advanced breeding tools and expertise, and drought-tolerant transgenes for use in WEMA research. It is estimated that the maize varieties developed over the next decade could increase yields as much as 20 to 35 percent under moderate drought conditions compared to the hybrids available in 2008. This would equate to an extra two million additional tonnes of food during times of drought for participating countries. Another example of a successful public-private partnership has been studied by IFPRI in their 2008 report “Building Public Private Partnerships for Agricultural Innovation”. The project based in Bolivia aimed at improving the productivity and competitiveness of peanut cultivation in the Mairana Valley and sought to improve income for peanut producers by 25%. Several partners were involved in the process: The Association of Oilseed and Wheat Producers (ANAPO) assumed responsibility for technical assistance and technology transfer, while the Bolivian Agricultural Technology (SIBTA) and the Mairana municipality government provided the financing. A fixed price for the product was set before the harvest and ensured by a buyer, Shirosawa S.R.L, which markets peanuts to international markets in Japan and elsewhere. Both ANAPO and the SIBTA had previous experience with development projects in the peanut sector, and as a result, had access to a broad spectrum of information about principal actors, production procedures and the commercialization of peanuts. In fact, it was this knowledge of the opportunities and limitations in the peanut sector that motivated them to form the partnership. The benefits that the producers have received from the partnership include a reduction of production costs by 30 percent, a 40-percent increase in yields, the strengthening of the farmer organization, and the transfer and introduction of new technology. In addition to achieving the project’s goals, other unexpected achievements were realized: new production and commercialization skills were acquired and partners initiated collaboration with other actors in the sector. It is clear that there is no ‘silver bullet’ that will solve the myriad challenges facing smallholder farmers today. It is also apparent that by combining the expertise of different bodies, that is to say, allowing partnerships between public and private sector organisations, we have the potential to reach sustainable and innovative agriculture solutions. A new report has been published by the Belfar Center for Science and International Affairs, entitled “Feeding The Next Generation: Science, Business and Public Policy.” Inspired by a global panel event held in February 2010 in association with CropLife International, Biotechnology Industry Organisation (BIO) and Council of Agricultural Science and Technology (CAST), the paper supports the legacy of Dr. Norman Borlaug and his commitment to eradicating hunger through scientific innovation in agriculture. It assesses both the risks and benefits of utilising biotechnology to enhance crop yield, and urges the beginning of a ‘Second Green Revolution’ in order to meet the increasingly urgent demand for food, feed, fuel and fibre. Modern, science‐driven farming including genetically modified crops represents our best chance of generating the increases in agricultural productivity necessary to feed our future. 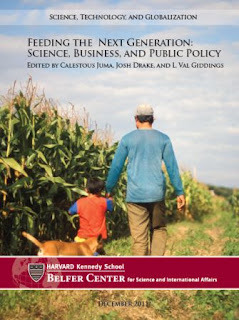 The paper explores agricultural productivity strategies in the past, present and future as well as detailing the wealth of technological advancements available to combat world hunger, which are deemed “critical” by editor Calestous Juma, Director of the Science, Technology and Globalization Project at Harvard Kennedy School. It also outlines the challenges science-based approaches to global agriculture face, most notably the lack of universal acceptance of genetically modified crops and the precautionary regulatory regimes in both Europe and low-income, developing countries that are inhibiting the research, development, and use of genetically modified crops. The report argues that the challenge to food security can be met by enhanced agricultural productivity, provided there is greater investment in agricultural research, more innovation and investment friendly regulatory regimes, and enhanced global and regional networks for knowledge and technology transfer. During the live debate, readers will hear from both sides of the motion, with Pamela Ronald, Professor of Plant Pathology at the University of California, defending it, whilst Charles Benbrook, Chief Scientist at the Organic Center, is against. Today, Howard Minigh, CropLife International CEO, is featured as a guest blog in the debate. Today, more than ever, farmers are burdened with many challenges: feeding an increasing world population; producing crops despite extreme growing conditions brought on by climate change; preserving and improving scarce natural resources such as water, soil, energy, forests and air—while also stewarding the land for future generations. To meet all these challenges, farmers must adopt sustainable agricultural practices. It is critical that farmers have access to a full range of farming tools, including everything from training in farming techniques, to machinery and equipment, to choice in inputs and seeds. The public can go to the Economist Debates site and add their own comments and cast their vote on the discussion.